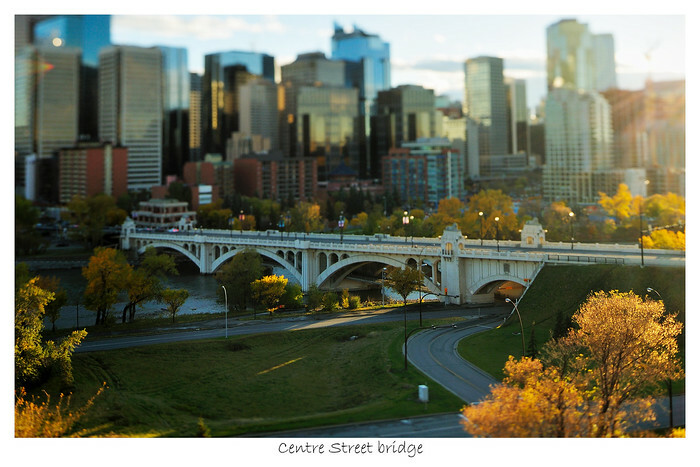 This is the Bow in downtown Calgary. It will be the tallest building in our skyline when it's complete. I've been driving past it for a long time on my daily commute. It often catches some nice light or is enshrouded in fog and I've been taking pictures of it from my car for a while now. Not all the pictures are great but sometimes they work out. I bought a new car a few months ago and it has a sunroof ( my first sunroof.. whee ! ) so now I can shoot straight up. Driving to work, I often see this view at 68th and McKnight. For a while now I've wanted to shoot it. I like how all the street lights are standing there in a cluster around the Stoney/McKnight interchange. 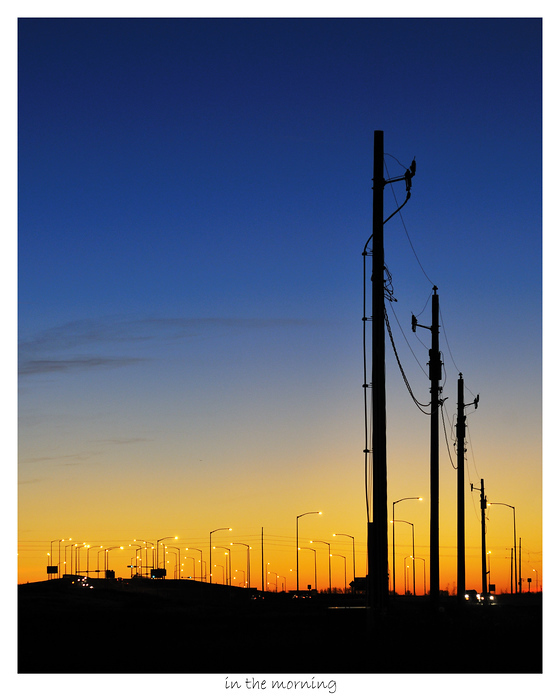 The power poles help to lead you into the photo. On this day, there was a nice orange/blue colour gradient and my camera just happened to have the 85mm on it which turned out to be a good focal length for the composition - I pulled my camera out of the bag and snapped this photo while waiting for the light to change. I always take my camera bag with me. Sometimes I get lucky and what I've been waiting for just shows up. 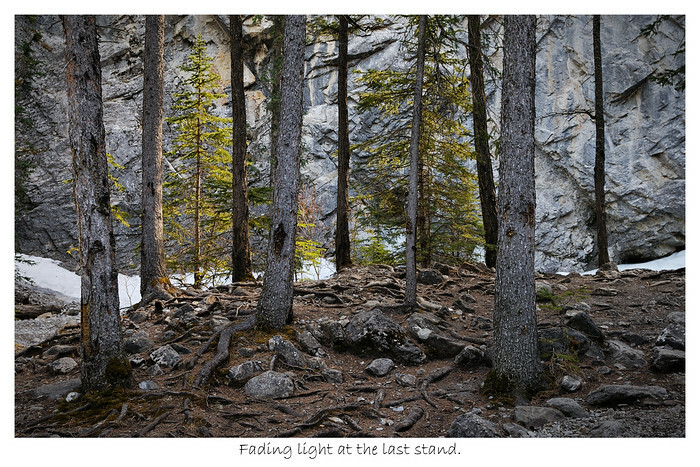 We went to Banff for the Thanksgiving weekend and stayed at the Douglas Fir resort. I was hoping to shoot some spectacular mountain scenery. Just before we got to the hotel, there was a herd of Elk on the side of the road Conor and I got out and took a look at them. There was one male and a bunch of other female and young elk in the herd. The male had a real nice rack :-) we watched him for a while and I was hoping he'd move off into the trees so that it didn't look like he was standing on the road, but for the most part he stayed on the road. 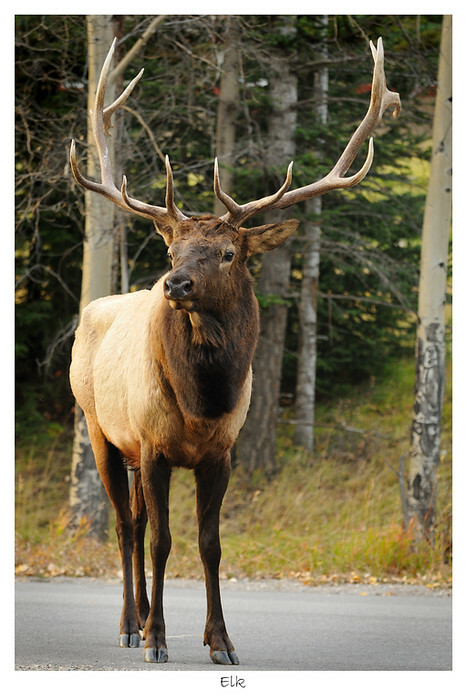 We had to be careful though because the Elk were rutting ( if thats the way to say it ) and they can be quite aggressive. The more I look at this picture the more I like it. I wasn't sure at first. I was driving home up Center street and had just crossed the bridge. There is a steep road just after the bridge that climbs up the hill and gives you this view. The sunlight was nice so I stopped and took a few shots from the side of the road. 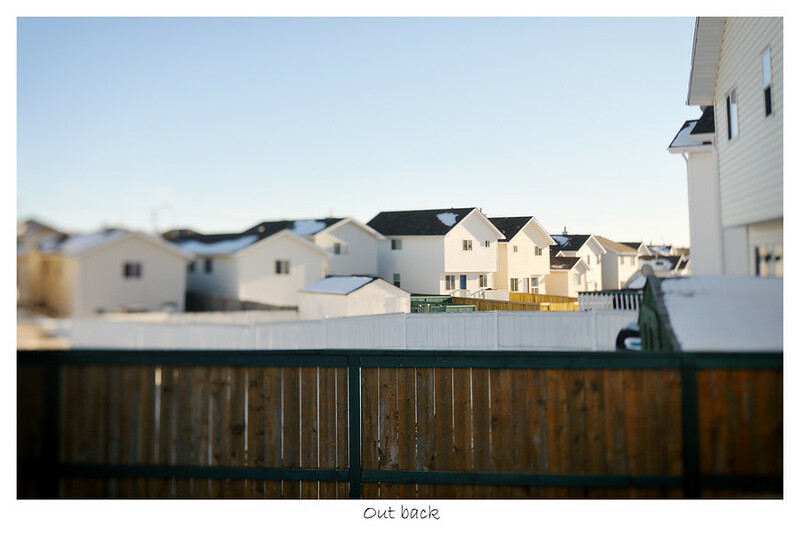 I was shooting with a 24mm tilt shift lens. It's a prime lens which means it only has one focal length - I can't zoom in and out to compose the shot. 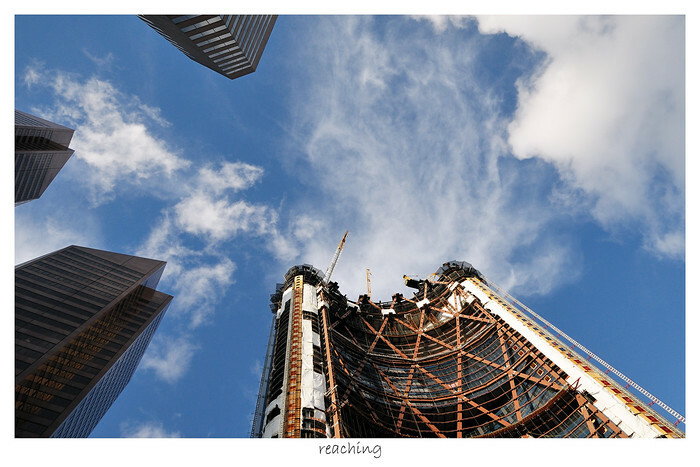 At the time I felt that the composition was really tight and I was worried that I wouldn't have enough sky in the shot. I`m still learning how to use this lens - which is manual focus and has tilt/shift movements that allow me to adjust the focus plane so that it`s not always perpendicular to the lens. I was trying to get the focus plane follow the bridge and have the edges out of focus to draw your attention in. The colours are nice and I was lucky enough to be there with the sun coming in at a low angle. 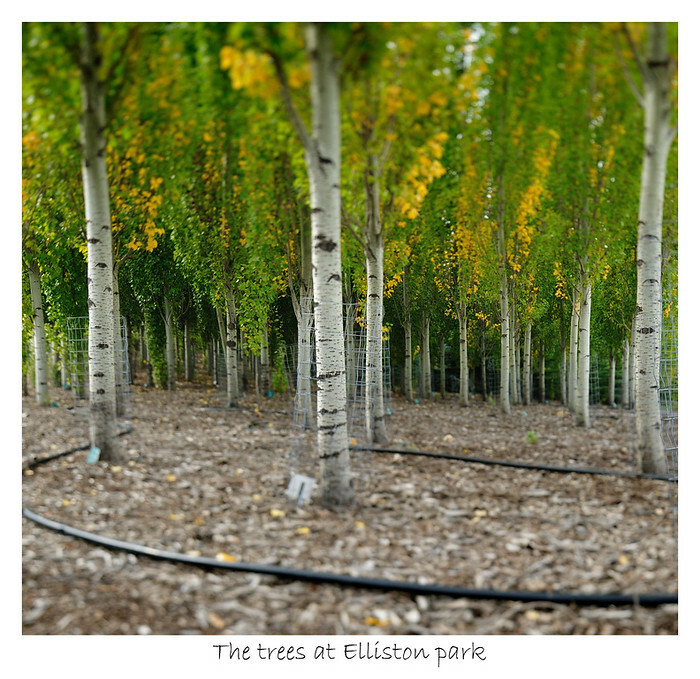 The kids were very excited to show me the trees at Elliston park in South East Calgary. They'd been there the day before and had spent time in the trees playing hide and seek and really really wanted to go back. I was thinking I wanted to run to the hills but time constraints and common sense prevailed and we ended up spending a couple of hours at the park. I walked along the path in a small loop while the kids were in the trees playing. After a while I decided that maybe there was a picture here and sat down on the grass to compose a photo. I liked how the trees were all lined up here and how they led into dark shadows. I tried to enhance the shadows by adjusting the focus to highlight them. The turning leaves added some nice texture. I wasn't sure about the hose, but there it is. The trees are all planted as part of the first BP Birthplace forest. Each of the trees here have a name associated with them. highway to the top of Mt. 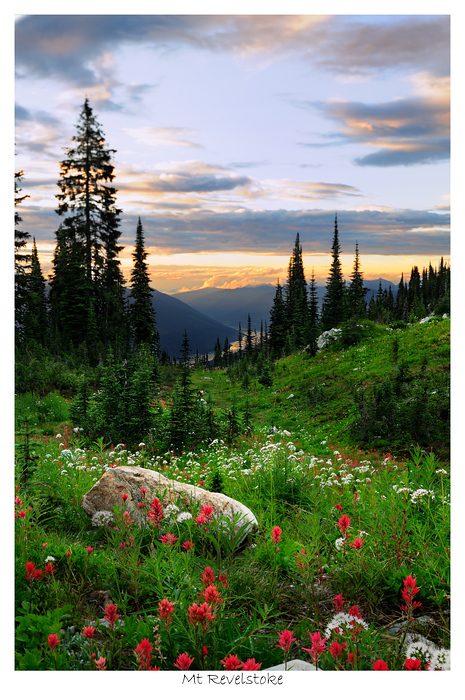 Revelstoke in British Columbia. A good way to visit would probably be to get up early in the morning, maybe packing a lunch then drive up the long twisty road at a reasonable pace - taking care because of all the switchbacks and blind corners involved. After reaching the end of the road you could spend a few minutes finding a parking space. Maybe look around a bit and trying to get your bearings after parking the car. I'm sure there are signs posted with information that lets you know where the trails are. Maybe there would be some history about the parkway on those signs and you could pick up some interesting tidbits from that. From there you could go and figure out what it was you wanted to see. If you were a wanna-be photographer you might have a chance to scope out where you wanted to be when the light turned nice during the fabled golden hour, assuming you were allowed to stay that long. Hi, it's been a while since I've posted.. not that I've stopped taking pictures, but just neglecting this process a bit. This blog is suppose to complement the pictures that I put up on my smugmug site. The idea was that I'd write something about a picture so you, the reader, can better connect with the photo, or at least have some background around the pictures. Every picture has a story and that story should be told. So here I am posting an entry and linking a photo. The photo today is a rainbow. I knew it was raining - hard - cause I'd gone around and tried to hook up all the drain pipes on the house so that the water wouldn't collect around the foundation and I got pretty wet doing so. The reason that the drain pipes were all disconnected is "kids". That's all I'm going to say about that. Heart Creek on Clare's birthday. So today was Clare's birthday, she's eleven now.. I can't believe how fast everything is going by. We went to Banff for dinner to celebrate and on the way we stopped at Heart Creek for a walk - which was Clare's choice. It was real windy while driving out but luckily Heart Creek is a pretty narrow valley nestled between some mountains and the wind didn't affect us while we were walking. I've processed just one pic so far and here it is. I'd found a tree stump that looked a lot like a baying wolf up on the side of the hill at the end of the trail. Initially I didn't have my tripod with me and I was having a hard time getting a sharp picture because it was a little bit darker where the stump was and the shutter speed that the camera wanted was pretty slow at 1/20th of a second. I really needed my tripod. So I climbed down the hill got my tripod and was heading back up when Jen said that they were going to start to head back cause they were getting a bit cold. Ok I said, thinking I wouldn't be too long.. I climbed up took a pic of the tree-stump wolf, took a few other pics of some trees next to the cliff and climbed back down to where Jen and the kids use to be, thinking I'd start to head back. For a few weeks before and after the first day of spring - when the rising sun is still low on the horizon - the light will pour down the street wrapping everything in it's golden hue. I think this light is magical. As we move further into spring towards summer the sun will continue it's march northwards the angle will change and the effect will be lost. Until the fall when the sun starts to move south again. I love the changing of the seasons, and am looking forward to the light after so many days of darkness. Driving home on St. Patrick's Day, the sky was looking real nice. There was a big cloud moving across the city and the sun was starting to set and lighting it up from the side. I chased the cloud out east of the city for a bit looking for a place to take a photo of it. Most of the country side east of the city is flat. Driving past Conrich I've seen a field with a windmill in it. I thought that it'd make an interesting subject if I could get it lined up with the clouds in the background. The clouds were moving away faster that I expected, and soon they would be off on the horizon. I was a little nervous because I had to jump a gate to get into the field and I had no idea if the farmer lived in the house across the road from where I stopped. I didn't really want to get yelled at for trespassing in the field. 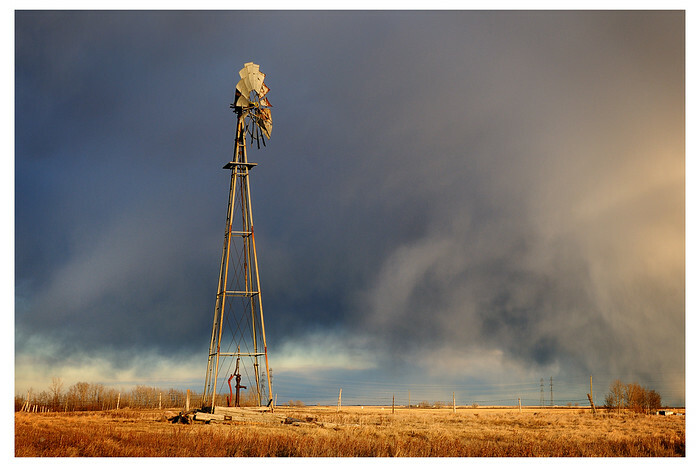 Eventually, I got enough courage to jump the fence and started walking towards the windmill. I noticed a lot of cow pies in the field which made me a little jumpy but I couldn't see any bovine's in the area so I felt a little safer. I took two lenses into the field with me, the real wide 10-24mm and the longer 24-70mm. I noticed that the 10-24mm was a bit too wide and because the sun was low behind me my shadow was entering the frame. I switched to the 24-70mm and zoomed in a little to compose some shots. The one above is one that I liked. I didn't notice until after that there is a pump in the middle of the windmill. 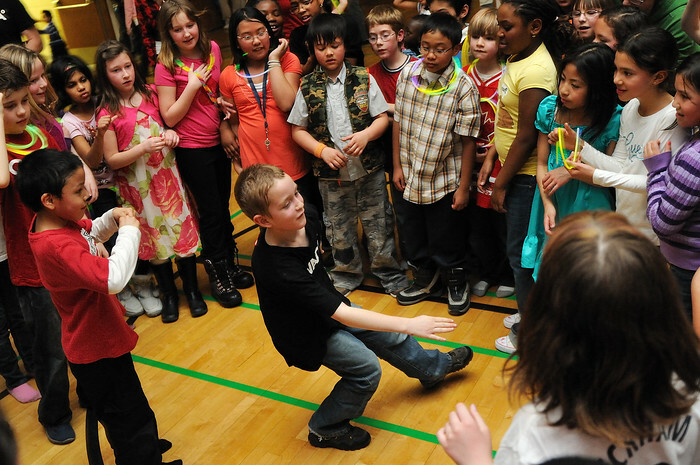 I went to the kids school dance. Brought my camera, and had fun snapping pictures. I was in Houston on a business trip in early February. All the IT Leaders from my company came together to discuss IT things, from our Australian region Jamie Paterson was in attendance and I spoke to him a little bit about his photography pursuits - in his spare time he's a big Australian landscape photographer. It's because of his influence that I tried to make a couple of large panorama's when I was in Vancouver. Here is a shot of English Bay with BC Place ( where the opening ceremonies where held ) and some of the Olympic venues. The big Q was a pavillion put on by Quebec, the orb on the right was a Saskatchewan exhibit. This particular photo is 14 stitched images, and was taken on the morning of the opening ceremonies for the Vancouver 2010 Winter Olympics. I'm hoping to use this technique more this spring and summer as I start to find the outdoors again. It feels like it's been forever since I've been to the mountains. 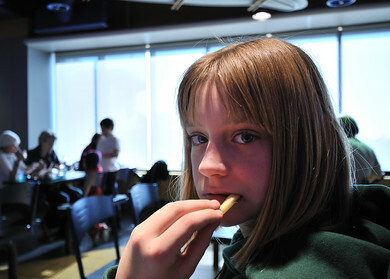 Before flying out we had lunch at the Calgary airport. Our Plane getting ready to take us to Vancouver.. I was very fortunate to be able to attend the 2010 Vancouver Olympic opening ceremonies.. While in Vancouver I was able to see the opening ceremonies a short track speed skating event and a medal ceremony. As far as pics go, I only have one for you right now and here it is.. a panorama of BC Place prior to the Opening ceremonies.. If I was smart I would have done the same during the ceremonies itself, maybe during that awesome rendition of Hallelujah by K.D. Lang but because I'm not all that smart this is all you get from a panorama perspective.. I snapped 11 shots and merged them into a single photo using Hugin. I didn't do much processing or whatever to the pics other than to convert to .jpg, and overall I liked the results here.. 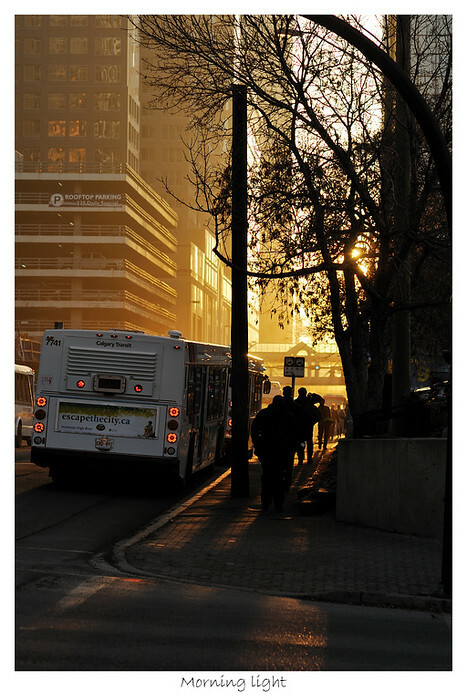 If your interested in a print, the original is 16800x3920 pixels, please e-mail me and we can talk about it. 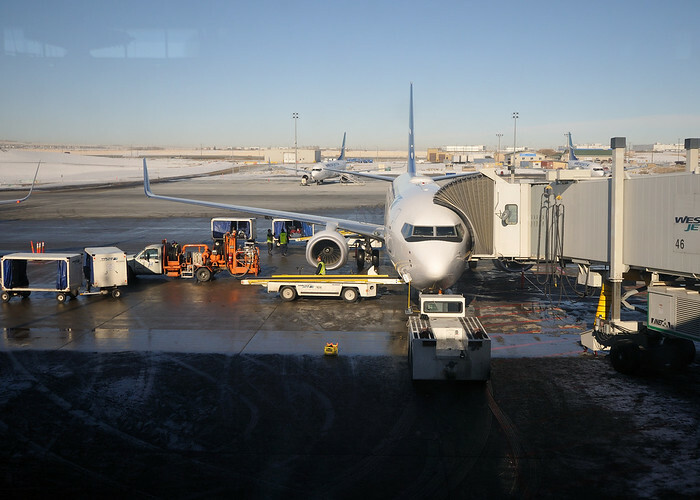 I was flying home from a trip to the US and had brought my camera and a small collection of lenses with me as carry-on. I spent the entire four hour flight with my head glued to the window searching for and taking photos of the interesting shapes and textures of our earth. When picking a seat for the flight I wanted two things - a window on the left side of the plane and a seat that was forward of the wing. I wanted to be on the left side so I’d see the mountains when we flew close to home and I wanted to be ahead of the wing because exhaust from the airplane engine will distort details in the photos. As the plane approached Calgary I got pretty excited at seeing the river with the textures created by the light and shadow, it was exactly the kind of scene I was hoping for. The challenge to shooting out of the plane window is that it moves pretty quickly and you don’t have a lot of time to make the composition, and if you miss - it’s gone. I zoomed out to 22mm to capture as much of the river as I could and also was able to frame in the mountains. What I like about this photograph is the different textures that appear across the frame, from the deep bold cuts in the foreground to the soft, almost ethereal, mountains in the distance. 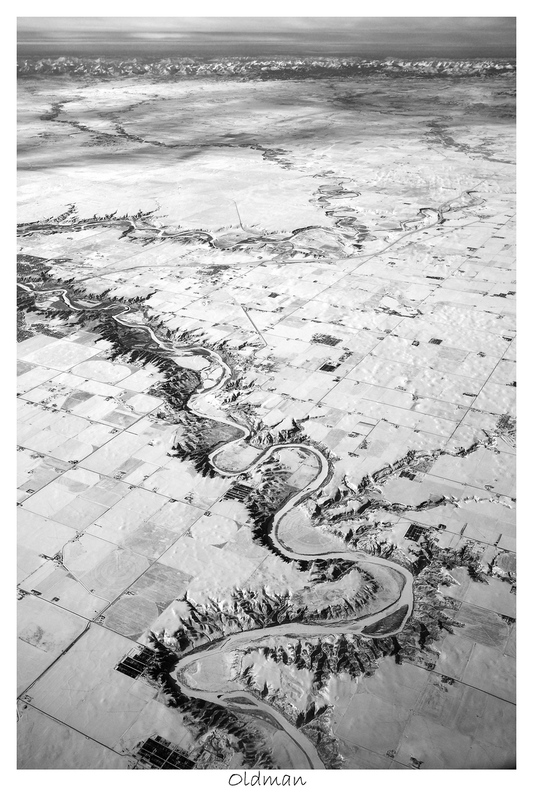 Later, I was able to locate the same view on Google Earth and discovered that the river in question is the Oldman river that flows through southern Alberta just south west of Fort Mcleod. Conor and I went skating this afternoon.. we drove around a bit looking for a skating rink we passed one in Renfrew and ended up in Crescent Heights.. There was a sign on the gate that said no non-members allowed but there was no one on the ice and the shack was closed up so we geared up and did some skating. Conor goin for a goal.. 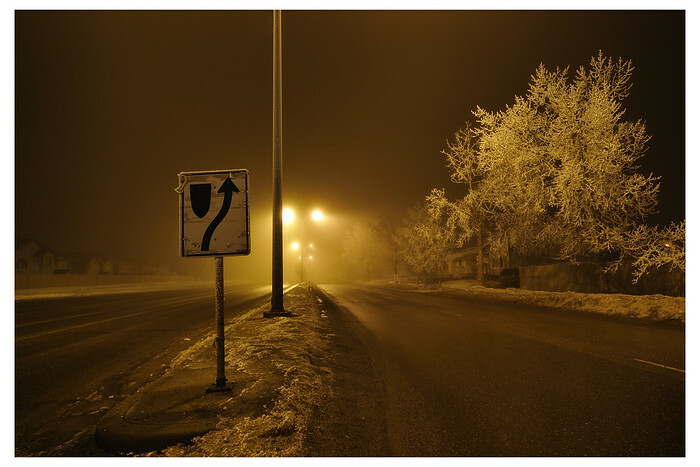 The city has been under a lot of fog and low lying clouds the last few days, lots of hoar frost gathering on the trees. 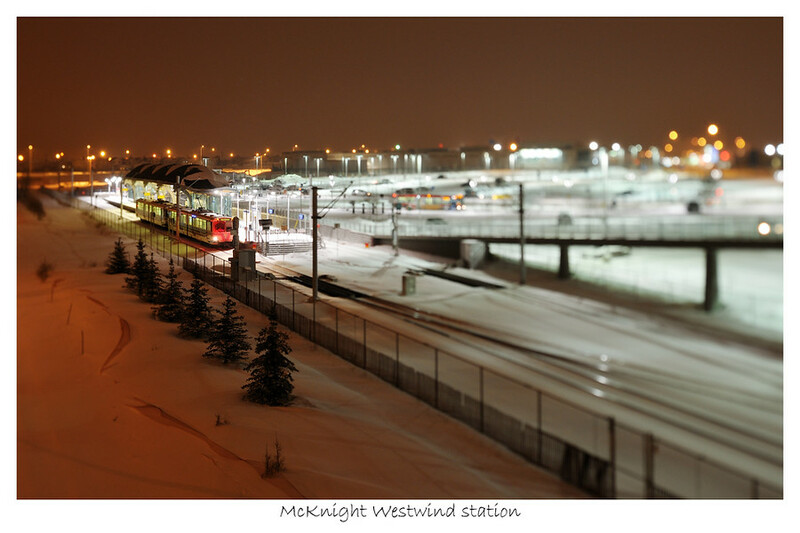 I went out side late at night and froze my fingers taking a few shots at the otherworldly light. This is one that I like. After the hysteria of Monday at Olympic Plaza and the arrival of the Olympic torch in Calgary on Wednesday we drove out to Banff to see the torch there. We left Calgary just after 4:30pm from the McDonalds by Calgary Olympic Park and drove to the town of Banff. 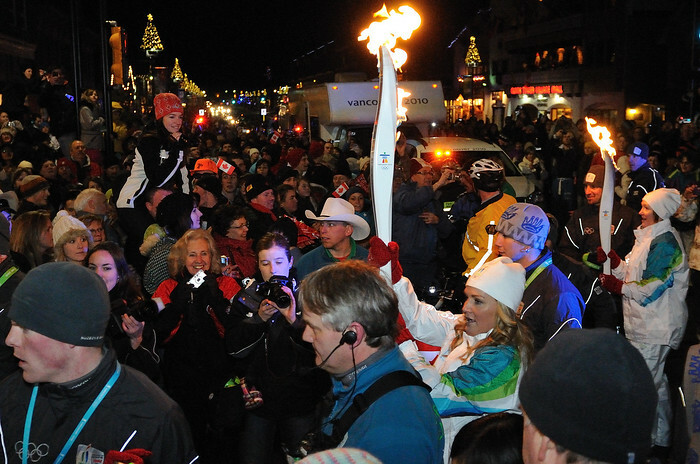 The torch was suppose to start making its way down the streets of Banff starting at 6:15pm and to be presented at the end of main street in the park at 7:00pm. Olympic Torch comes to Calgary !! 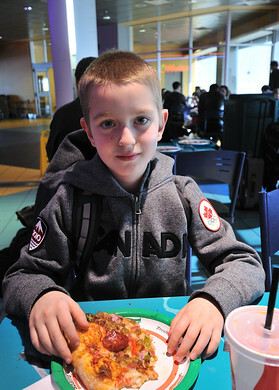 On Monday, the Olympic torch came to Calgary and there was a big celebration down at the Olympic plaza. Way back in 1988 Calgary hosted the winter Olympic games and everyone was excited to see the torch make it's way through the city again. For Clare and Conor, this may be the only chance that they'll have to witness this kind of event. I'm a little disappointed that I didn't realize the significance of 1988 at the time that it was all going on.. but such is the curse of being an introvert like me. Jen brought the kids downtown after school and I was going to meet them on Stephen Avenue after work. 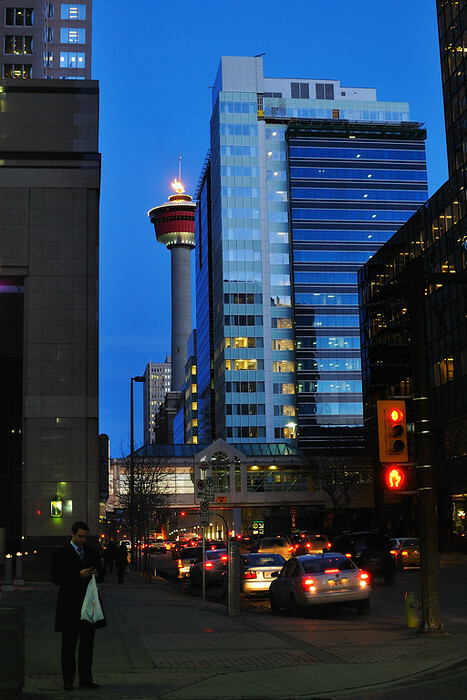 Walking down 9th Avenue, I saw that the flame atop the Calgary Tower was lit so I stopped a few times to take some shots before heading over to Olympic Plaza to meet them. Was called into work around noon today and on the way home I thought I'd stop at the zoo and see how the botanical gardens are shaping up since they re-built them. I was there about a month ago and they had the one main room open and the other dressed up with nothing but poinsettia plants for Christmas. The Christmas room is being re-done and was closed today. Other than that all I looked at today was the tigers. 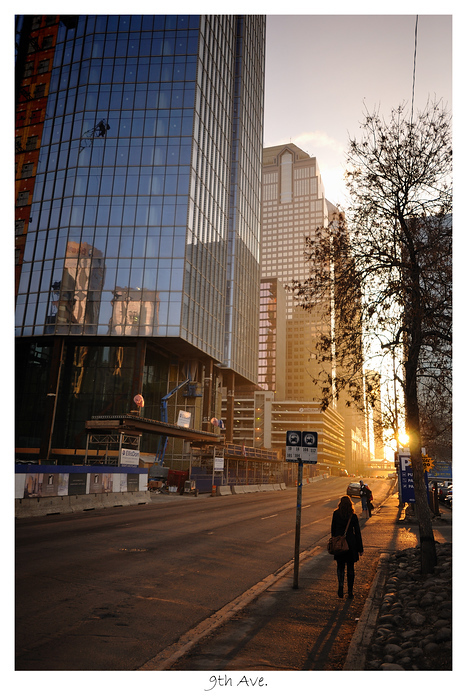 While I was watching them the sun broke down below the chinook arc and I was getting some nice low winter light. 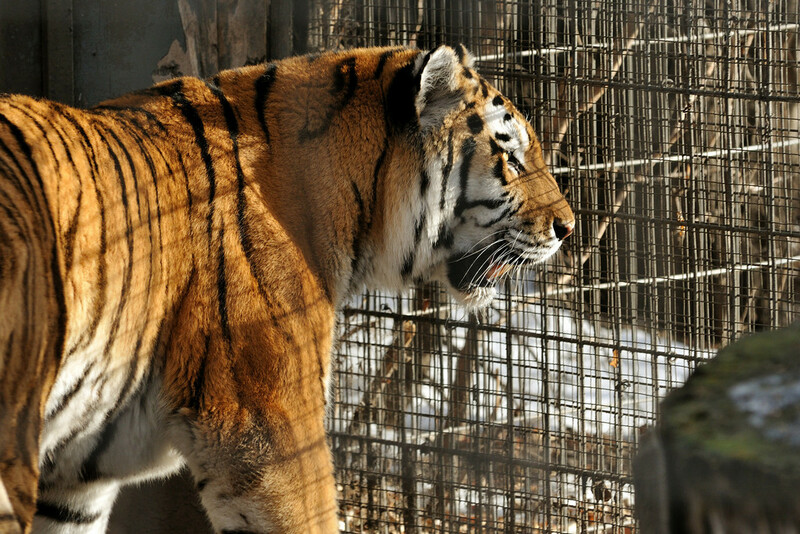 I watched the tigers pacing the cages for quite a while. I wanted to get a nice dramatic shot using the bright sunlight. I love the warm orange colours on the tigers. After watching them for a while I'm a little bit in awe at how powerful and majestic these animals are. This is one shot that I like.. I was looking for some kind of activity that would give me some unique shots. When I was walking away I looked back and saw that one of them was lying in his hammock with his head thrown back yawning. I guess I wasn't patient enough ;-) I have a few shots to review and any others the I post will be found here. 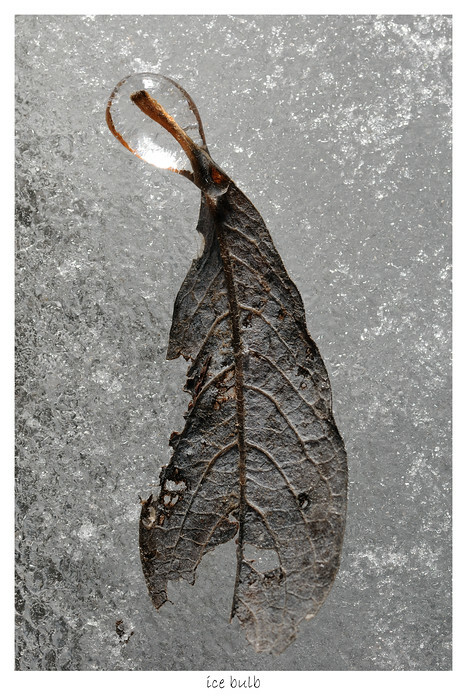 Went for a walk at Heart Creek and found this leaf with a bit of ice around the edge stem just sitting near the edge of the creek. This was my favorite picture from our walk. I positioned the leaf on various rocks and tried shooting from a few different angles - trying to find something that looked good. After taking several photos I thought the images I was getting were rather flat so I brought out my flash and tried to add some texture by creating some shadows and highlights. I held the flash on the side at a low angle, shooting down into the ice to create the image that you see here. 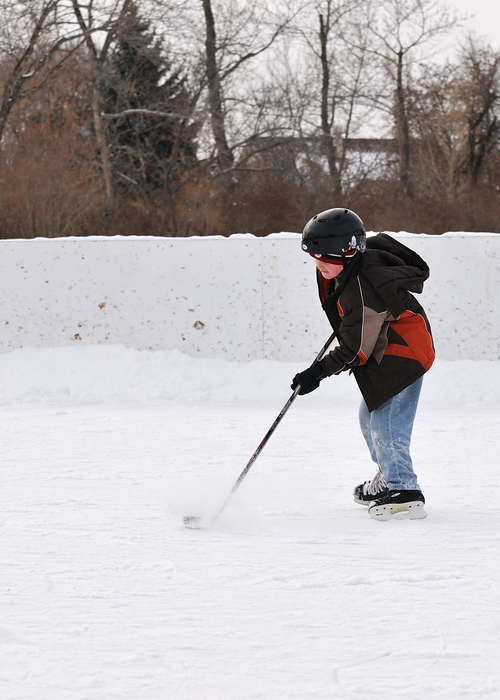 In post processing I spent about fifteen minutes cloning out bits of dirt and sand in the surrounding ice. Overall, I`m pleased with how it turned out. 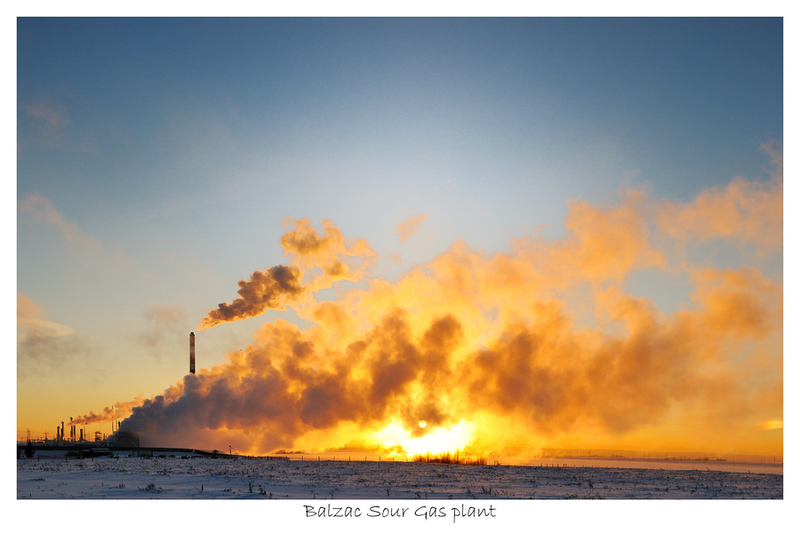 As I post more pic`s from the walk, you`ll be able to find them here.